When a friend asked me to come over to pick roses from her garden to make some arrangements for a dinner she was hosting, I didn’t hesitate before saying “yes”. Her new house was known for having a lovely garden of mature English roses. I went over in the morning to clip, before the sun could overheat the blooms. As I meandered around the aged bushes, looking for the perfect buds, taking in the subtleties of the scents each bush offered. Many of the roses were in full bloom so had to handle them very carefully to keep the petals on. I brought them home and stowed them in buckets of cool water in the shade in my courtyard. I found these oval shaped zinc vessels at the grocery store when I lived in France, the Super U in Beaulieu~sur~Mer, they came in 3 sizes and I bought as many as I could find. When I moved back I packed breakable items like candles and perfumes inside the nested vessels, everything arrived back in tact. 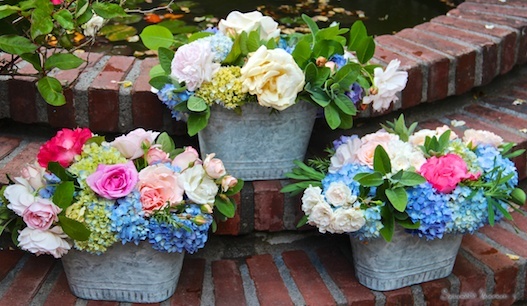 At first I planned on using the zinc buckets just as just a resting spot, I thought I’d use glass vases for the arrangements, but the flowers looked so pretty and garden-y I decided to keep the zinc in my bouquet kit. 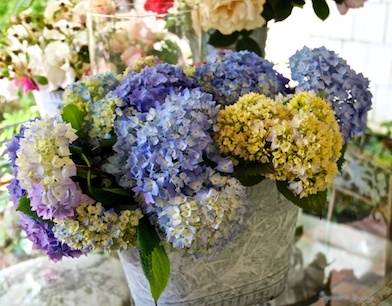 In addition to a flattering container, nothing compliments flowers better than an array of greenery. I grow lots of greens so that I always have plenty around for arrangements. 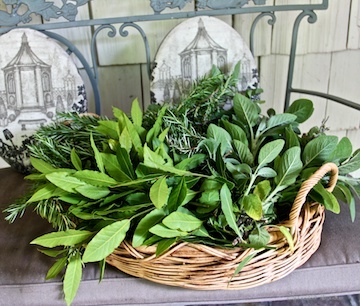 Keeping in the English Garden theme I clipped a selection of herbs for these bouquets, spiky rosemary, shiny, deep green bay laurel and soft sage leaves. After the flowers had a few hours to chill and soak up some fresh water it was to arrange. My basic formula for making bouquets is to start out by establishing the shape, and a foundation of support using bulkier greens and flowers. Below, you can see how I’ve filled the zinc ovals with the hydrangeas and herbs. Next, I fill any openings with with my accent flowers, in this case, the roses. Finally, I add more sprigs of greenery to create a finished, full, lush look. I wish I had taken photos at the party, but my camera got misplaced. 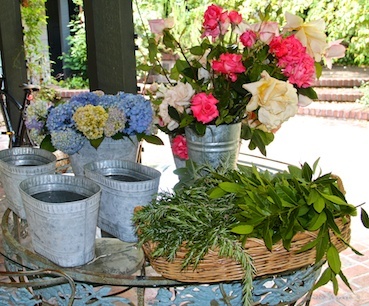 These three arrangements down the center of their weathered wood outdoor table. From the table we could see the rose garden from which the flowers were clipped. These are metal vessels wrapped with birch bark, I love that natural beauty of the bark. The center bouquet I made for the hostesses kitchen, it’s all bay leaves and lavender, and the bay leaves came in handy as a garnish for a few of the platters at dinner. 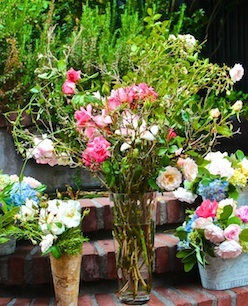 The other two are filled with rosemary and sprigs of white climbing roses, these went on the kids table indoors. Next is the arrangement I did for the entry, REALLY wish I could have snapped a few shots of in the house because it’s hard to see the details against the rosemary and in this background. The house is finished in soft neutrals, so this bouquet really stood out in that setting. Building this arrangement wanted to emphasize this eclectic assortment of extremely long stemmed roses, so I filled the vases with lichen covered branches, which helped to support the tall stems. White climbers droop down on the sides of the bouquets…though you can’t see it very well. but we were all delighted to see her after all was said and done. 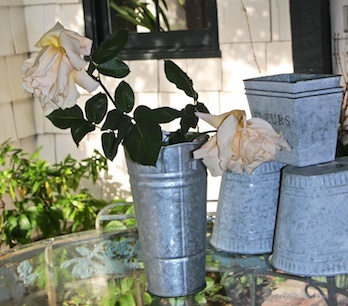 What fun to have such beautiful material to create with – your new zinc containers included. 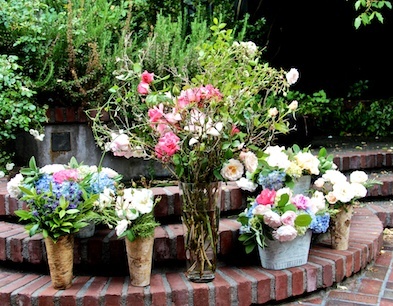 Hi Emily, These arrangements are so lovely and creative! 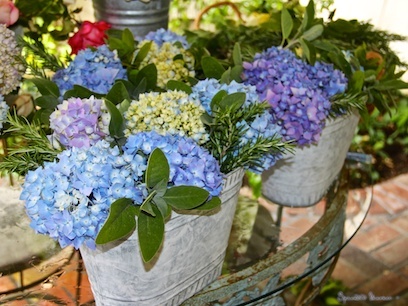 The use of the galvanized buckets is wonderful! Is there anything you can't do?! Beautiful! Wow…you are so incredibly talented. The arrangements were gorgeous and how wonderful to be able to cut flowers from her own gardens!! Thank you for all of the nice compliments, it was a wonderful process. One thing I failed to mention is the fact that when I woke up the next morning I still smelled the scent of roses on my skin… what treat. Gorgeous, Emily! 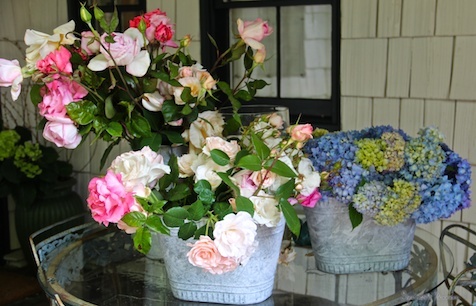 What fun to have such beautiful garden roses to work with. I love your zinc pots and I'm glad you decided to use them for your arrangements. The hostess must have been thrilled with your creations!